Designed for chemical portable and cassette toilets. 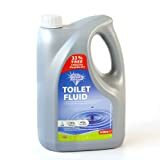 The Blue Diamond 4L Toilet chemical with 10% formaldehyde is highly effective, leaving you with a pleasant smelling toilet after use. The cleverly designed Toilet Chemical will break down waste in the waste tank of portable and cassette toilets.